Fox Labs OC (OC stands for oleoresin capsicum)is the best choice for pepper spray. The fog spray pattern is wider and makes it easier to hit your target in a stressful encounter. The spray droplets are also "atomized" and smaller than the stream making intake into the respiration system and mucous membranes of the target a little faster and quicker-acting. A slight caveat is that if outdoors, some amount of the fog also is subject to the direction of the wind and you may get some "blowback" if the wind is against you. It may make you cough a little but not nearly the effect as on your target. The stream spray is like a water gun, a pencil stream. It squirts a lot of formula in a more focused output. It may subject you to less blowback but also requires more accuracy to hit your target. Law Enforcement and security professionals tend to favor the stream pattern. Aim for the forehead or top of the head if the target is at the far end of the range (10 feet+) to allow for ballistic drop off. Closer in just go for the eyes and face. The formula is the same as described in other sections, the 5.3 MM SHU pure base oleoresin capsicum (oc) Fox Labs is famous for. From time to time the government makes changes to c ategory classifications for various ingredients used in industry. Recently, one of these changes n ecessitated our changing the solvent used in our famous FIVE POINT THREE formula. The primary diffe rence is the new solvent weighs less than the old, so although the amount of the formula in our u nit's will remain the same, their net weight will n ow be lighter. The volume, potency, effectiveness, reliability and non-flammability of this unmatched formula remains the same. Pepper spray must be shipped by UPS ground service due to Dept. of Transportation regulations for hazardous materials. 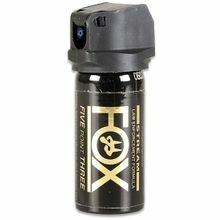 We cannot ship Fox pepper spray to NY, MA (w/o FID) HI, AK or APO addresses. Police Departments need to submit their request on department letterhead (fax: 888-345-2533). MA residents must have a firearm ID card. Fox Labs Warranty: Fox Labs products are guaranteed to be free of manufacturer defects for 2 years. If your Fox Labs product fails to function normally within 3 years, return the can to us and we will send you a new one. Fox labs has the manufacture date printed on their cans. This is a "birth date", not an expiration date. Heavy Stream Pattern goes 17 - 20 feet. *FOX LABS does not use tiny nozzle openings that reduce the amount of formula discharged per burst. Other companies do this so they can make claims about more bursts per unit for reasons of marketing � to make their products sound better to those who don�t stop and think about what this actually means. The reality is that 2, 3 or 4 ounces of formula is the same volume regardless of whose canister it is in, so the only way to get more bursts from a canister is to reduce how much formula is being discharged per burst. FOX LABS� units discharge as much of their famous formula as possible per burst to make sure you have an opportunity to stop the assailant/s as quickly as possible. Fast shipping, well packaged, item as described.